Are you looking for a unique, stylish toilet that will work with virtually any bathroom interior design? Do you want something that will express a level of hand-touched elegance for a price that is highly affordable? With the Kohler English Trellis toilet, you’re going to be putting a fixture into your bathroom that is very reminiscent of the chintz patterns of England. It’s a two-piece toilet system, features and elongated bowl for an extra level of modern appeal, and at 40 pounds, is light enough to be installed in most locations. Here’s the best part: you can save over $700 off the MSRP of this item if you make your purchase on Amazon. What Are the Features of This Kohler Toilet? 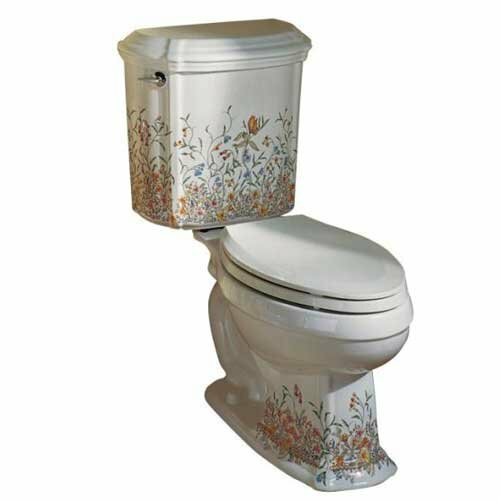 The primary feature of this toilet, outside of its decorative designs, is the fact that it is also an efficient toilet as well. You’ll only use 1.6 gallons per flush when this toilet is properly installed in your bathroom, yet you’ll get a strong enough performance that you’ll feel like you’ve got double the power! That’s because of the ingenium flushing system, which features an automatic flow-control fill valve that gives the toilet a consistent water flow at a variety of internal water pressures so that annoying splashing doesn’t come all over you. There might be some issue with the fact that there is just a 2 inch flush valve on this toilet, considering there are some makes and models that offer a flush valve that is double the size. Although a larger flush valve does offer a faster flush because the water from the tank drops more quickly, the valve on this Kohler model offers an ideal flow that maximizes the momentum of the water’s natural energy while it completes each flushing cycle. Now combine that with the Vitreous China that has been sealed as the foundation of this toilet’s construction and you’ll end up with a direct flush toilet that is incredibly easy to clean and maintain. If you want the best combination of form and function that is available right now, this patterned toilet could very well be what you’re looking to get! What About the Quality of the Artwork? The biggest question about this toilet is a logical question to ask: how well does the artwork stay on the toilet? After all, the bathroom is a high moisture environment. Even though the water vapor of a shower doesn’t often reach all the way to floor level, it could affect hand-painted art, right? Here’s the good news: under most conditions, even in high use bathrooms, the artwork of the trellis is going to stand up to the tests of time. Some scuffing can occur with heavier shoes, but that would by the only primary concern. As for improvements, in some ways it would be nice to see a smoother flushing experience. On heavier loads, the flushing system can be a bit slow sometimes and that can cause some backflow that requires a second flush. Could a wider flushing valve prevent this? Possibly, but the fact remains that this is a quality toilet that comes with a fair price when the artwork is consider. Kohler is brand you can trust, this toilet looks spectacular, and we’ve got no major complaints. That’s why it receives our recommendation today. Click here to compare prices on Amazon and get the best price on the Kohler English Trellis Portrait Toilet.